Some 30 statues of the Buddha — consisting of a serene and centered face emerging from the ground — have recently sprouted in Chicago neighborhoods regularly wracked with violence. In a world where, for some of us, our eyeballs are increasingly colonized by endlessly streaming Instagrams on the one hand and numbing corporate advertising that jams our public spaces on the other, the impulse to recover the enthralling power of the image — not to sell and distract but to startle, thrill, unnerve, reveal — can signal both a therapeutic and political act of nonviolent rebellion. A troupe of artists are prying open the zone where images are neither commodified nor domesticated by editing the urban landscape with outsized photographs, capacious graffiti, and endlessly inventive paper and glue. Literally outsiders, they go public with bewildering visual moves aimed at stirring up a buzz of brain activity in the rest of us. While some of the work is overtly political, its power derives primarily from the way it reframes in a sudden and jarring way the physical and psychological architectonic jumble that most of us typically pass through without giving it a second thought. Another street artist who seems to share this attitude is Banksy, whom I recently found out about from a student of mine. He spraypainted a series of images on the Israeli West Bank barrier, including a picture of kids chipping a hole through the wall and of a ladder going up and over it. His website offers a gallery of photos of his clever and thought-provoking street scenes strewn across cities in Britain and the United States, often ironically embellishing some feature of a wall or building that was there already. When the Occupy movement streamed into the nation’s plazas, parks and city squares a year and a half ago, many things were at work there, but one of them was a recovery and redefinition of public space, symbolizing a kind of resuscitation of the heart of civil society and literally bringing out into the open the concerns — about economic inequality, about the lack of participatory democracy, about the need for transparency — that had been gnawing at us while we were cooped up and overheating inside. Artists like JR and Banksy, who are revamping the urban terrain one wall or subway at a time, have similarly been driven outdoors to reclaim this space and to provoke the rest of us to dawdle — and perhaps even to ponder. In Chicago there is a venerable tradition of street murals and graffiti (though the city also has a determined anti-graffiti effort). But recently another public art project has been provoking double takes in the city’s neighborhoods. Though Ten Thousand Ripples does not redefine public space with the same wild abandon of JR’s built-environment canvasses or Banksy’s effervescent but telling humor, it shares their determination to engage and provoke. 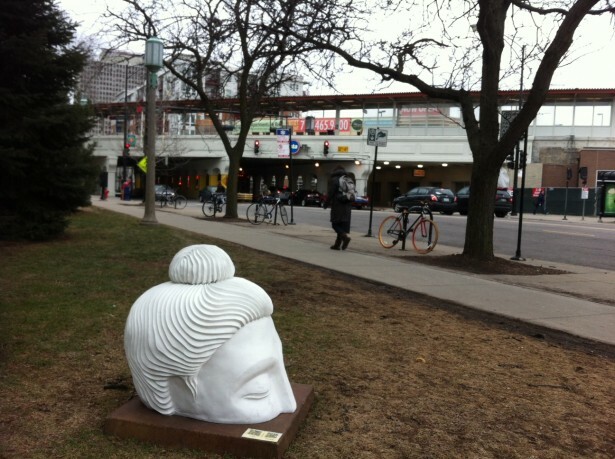 Some 30 statues of the Buddha — consisting of a serene and centered face emerging from the ground — have recently sprouted in Chicago neighborhoods regularly wracked with violence, including Pilsen, Back of the Yards, Little Village, Rogers Park, Uptown and North Lawndale. By late spring there will be one hundred. Created by artist and nonviolence educator Indira Freitas Johnson, Ten Thousand Ripples is collaborating with community-based organizations and schools throughout the city to inspire a conversation about peace and nonviolence. Some of the statues are 300 pounds. Others are smaller. I saw one at the edge of Loyola University Chicago in the Rogers Park neighborhood. It caught me off guard. Part of the statue’s power is this unexpectedness, but also the combination of familiarity and unfamiliarity it conveys. In a very general and diffuse sense, U.S. popular culture has come to regard the Buddha as a symbol of peace and equanimity — based, in part, on a range of complex historical and cultural developments over the past century. Some of us, in addition, are aware of Engaged Buddhism, the movement inspired by Buddhist teacher and activist Thich Nhat Hanh — and spread by the Buddhist Peace Fellowship — who have taken Buddhist mindfulness practice into the world to resist war and injustice. But none of this means we “get” these statues at first take. They resist easy categorization — partly because of the mysterious self-possession they radiate (a stately, composed visage half hidden by the earth), but also because they are not part of the traditional cultural codes most of us have been rooted in. This, I think, is one of the things that make them powerful. They are not immediately accessible. They force us to linger, to wonder — rather like the first Buddha whose enlightenment, and the peace and nonviolence that would flow from it, came out of prolonged waiting and stillness 2,500 years ago. One could legitimately question whether a symbol dramatically outside the cultural expectations of a wide range of Chicago neighborhoods is more intrusive than inviting. We’ll have to see if Johnson’s impulse — to wrest Buddhist statuary from the contemplative garden or temple and, instead, plop it down almost randomly in the heart of a large American city — can indeed ripple out into awareness and even action. Nevertheless, like all nonviolent experiments, the growing flotilla of Buddhist witnesses for peace floating out into the sea of urban grit and conflict wagers mysteriously but resolutely that transformation is possible. Change comes from individuals themselves. Cities beckon, then destroy, never learning, always aging. Forward is the only direction. In natural settings here on the Earth and to the Stars.